A live, staged reenactment of Ferguson grand jury testimony. So the backlash has started. The mainstream media don't want the truth about Ferguson to get out. They want to shut down the play. As you probably know, I wrote FERGUSON - The Play to cut away at the media myths, narratives, and outright lies that surround the death of Michael Brown in Ferguson, Missouri last year. So now, before they've even seen the play, the "critics" are trying to shut it down. Leading "critic" Kevin O'Keeffe, of the Art.Mic blog, said there is "nothing to be gained" by staging the play. This is despite the fact that FERGUSON is Verbatim Theatre, a genre that uses only actual court transcripts to tell a dramatic story. There will be no additions or subtractions--just the truth. But that isn't acceptable for these ideological gatekeepers posing as "critics." O'Keeffe described the play as a "danger" and said that the project "feels like a powder keg ready to reignite racial tensions." He added that it is an "incredibly frustrating provocation of the past." These attacks come before he even knows what's in the play! FERGUSON doesn't premiere until the end of the month, and I'm certain the attacks will intensify before then. So please help me fight back. 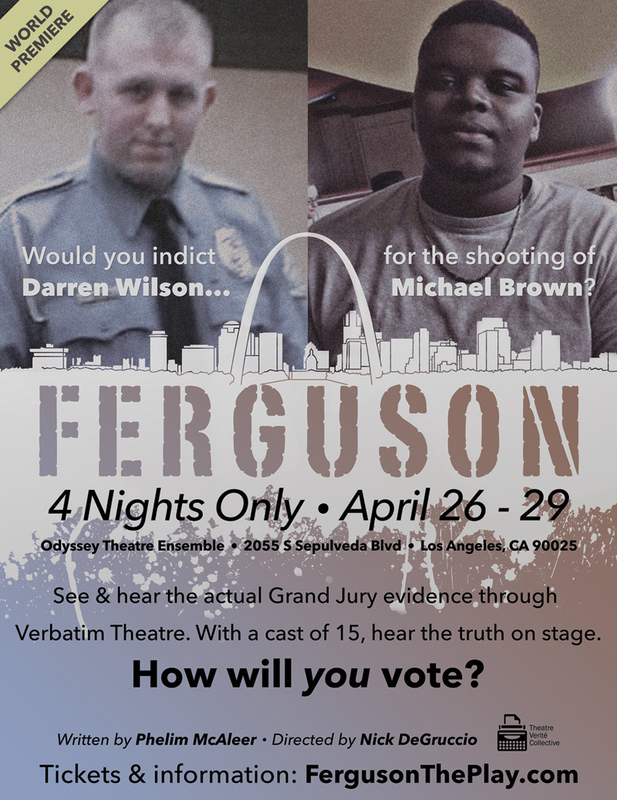 You can help bring FERGUSON to the stage in LA and to many stages across the US. Because of "critics" like Kevin O'Keeffe, I'm raising money for the production through crowdfunding. For tickets and information, visit FergusonThePlay.com. Even if you can't make it to LA, you can still be part of this historic production. Don't let the media silence the truth...again. Four performances of FERGUSON take place on Sunday, April 26 at 7 p.m., and on Monday, April 27; Tuesday, April 28 and Wednesday, April 29, all at 8 p.m.
For tickets and information, go to FergusonThePlay.com. Click the poster to the right to download a larger version. Copyright Â© 2015 Ann and Phelim Media LLC, All rights reserved.